The 1971-72 season brought the Kahoks to the Greenwood Campus at 2201 S. Morrison Avenue. Built to hold 5,000 spectators, there were no funds available to purchase the necessary bleachers. A deal was worked out with the Belle-Clair fairgrounds to purchase some surplus bleachers before the 1971-72 basketball season began. These bleachers turned out to be rather expensive and were not suited for good viewing from the upper balconies, but they would remain until 1993 when they were declared unsafe and replaced. Floor bleachers were installed on the north and south sides of the gym in time for the second season at this location. During this time, a temporary wall was built in the east balcony to make band room. The gym, also known as "the Purple Palace," was rededicated in the early 1970s and named after Coach Vergil Fletcher. 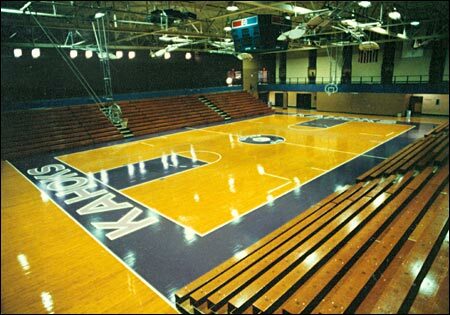 The Kahoks have occupied Fletcher Gym longer than any other venue. Interior looking northeast in the early 1980s.